The Cross series DR tie rod type hydraulic cylinders provide long life and reliable operation due to high-quality materials and workmanship. 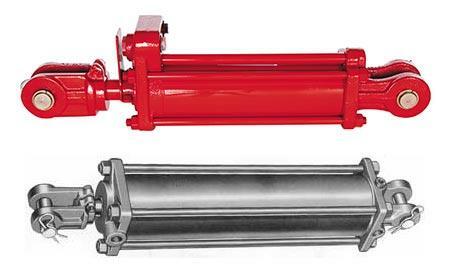 These hydraulic cylinders incorporate an internal mechanism for automatic rephasing (synchronizing) in a series circuit. The DR cylinders may be used as master or slave units or as slave units with DCR cylinders with hydraulic depth control. The Cross DCR series features hydraulic depth control with an infinitely variable adjustment from zero to maximum stroke. An internal mechanism permits the DCR cylinder to be used as a master cylinder in a rephasing system using the DR cylinders as slave units. Long life and reliable operation are provided by the many design features plus high-quality workmanship and materials. Rephasing cylinders are widely used on folding tillage tool implements.